Guess who are the latest producers to join the ‘Paddock2Plate’ mobile app, aka “foodie footsteps”! We are excited to be adding Alan and Shelley Green of Green Eggs to our growing list of farmers that can be found along our food trails in Victoria and Western Australia (…so far). Here’s a little bit of info from the Green Eggs website: Located at Great Western near Ararat on the foothills of the Grampians (just over 200km, from Melbourne) the Green Eggs girls have 480 hectares upon which to shake their tail feathers. Green Eggs are Green Eggs because the Greens run the place! 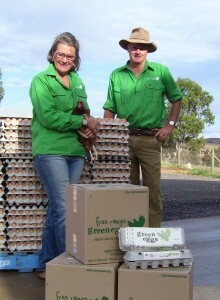 Head rooster Alan Green and his beloved hen Shelley Green apply sustainable and ethical farming practices. For the Greens, freshness and quality only come from happy and healthy hens.